Present: John (chairman), Sue, Nick, Betty, Gordon, Sally, Jonathan, Mary, Paul, Mick, Philippa, and Oona. This went extremely well. Approximately 50 – 60 people attended. Formal thanks were expressed to Da and Andrew for hosting. We decided on 16th October, and there will be a meeting of the organising team on Wednesday 8th September 8pm at number John’s. The date of 13th November was proposed and agreed. Sue and Nick volunteered to host. The date of Sunday 5th December was proposed and agreed. Jon and Sally offered to host. There would be carols beforehand as usual. e A new event was proposed: Film Night. Paul would think through the logistics to discuss in more detail at the next meeting. It was suggested that we try to keep the list of events fresh and have new events which would give as many people as possible to participate in something. It was proposed to include some drama and dance, including some revue-style sketches. It would be held in the upper hall. The first half of the evening would be in the existing format and would include those children who were participating, followed by adult musicians. After the interval the revue-style performances would take place. It was suggested that an open evening be held a couple of months before the event to explore performance ideas. There was a discussion of venue and several possibilities mooted: this would be explored nearer the time. The music evening would take place no more frequently than every 18 months. It would start and finish earlier providing more time to socialise afterwards. We would return to discussing this further in early 2011. In Anna’s absence, John provided the Treasurer’s report. The VRG financial situation was good: the bank balance was £435.12; Cash box balance £73.22; total balance £508.34. There were no outstanding items apart from some possible expenses for the Garden party. Green balloon day: £50.88 taken in cash for refreshments, expenses £8.19, net income £42.69. Garden party: £6.14 so far in expenses for invitation printing. It had been thought that joining a local branch of one of the national schemes might be possible. Having looked into this in more detail it appeared to be too much work for this to be feasible. Thanks were expressed to Jonathan for looking into it. It was agreed that spare cars for informal sharing might be advertised through the website. The photocopier was remaining with Mary and Paul for now. At some future time it might be housed by Ali’s mother. iv) attending a Council meeting every few months. Not onerous, but important. If you want to know more, contact Nick (jaylee@phonecoop.coop) or propose yourself, contact the VRG Chair (JohnFClarke@hotmail.com). It was agreed that firstly the communication requirements of the group needed to be specified. A calendar of events and a message board were agreed to be useful. To consider this further, including what web tools would best do the job, Paul volunteered to convene a subgroup and Jonathan agreed to participate. Oona reported that her husband Paul would be willing to set up the website if it was decided to continue with one, provided that someone else was willing to host it. Anyone with views to contribute should contact Paul – paul@my-lewis.co.uk. Jonathan reported that there was a lack of clarity as to whether the City or County Council was responsible. Both had given friendly responses but no result so far. There were a number of ideas worth pursuing, and some people had come forward and were very interested in this. Jon and Sally would talk further with Sam and Nick and Paul and draw the information together. 5 Neighbourhood Watch talk from Oona and Paul. Steve Morant of Thames Valley Police very kindly attended to give an overview of the Neighbourhood Watch scheme. People were invited to sign up to receive notifications from the local contact (Oona) and information leaflets about this were distributed. Mick agreed to put up the neighbourhood watch signs on lampposts as you approached or entered the street. Contact Oona at oona@feezey.net if you there are any specific questions you’d like answered. a) On 3rd July, we received a glossy from CAG OXFORD. b) On 11th June, we received a formal notification of a planning application for a single storey extension to No. 50.
c) On 22nd June, we received an email giving the date of Spring Clean 2011 (the next Oxclean event) as 4th and 5th March next year. d) Streets for people – Seven streets event: Sally had spoken to several folk who were not keen to close the streets. Other streets were working towards achieving what Victoria Road had already done. e) Street cleaning: Sally’s osteospermum plant had been destroyed! The Streetscene officer was going to call. 7 Thanks to Sally and Jonathan for hosting the meeting and to Betty for distributing the agenda. 8 Date of Next meeting: the next meeting would be on 21st September at Mick and Philippa’s. 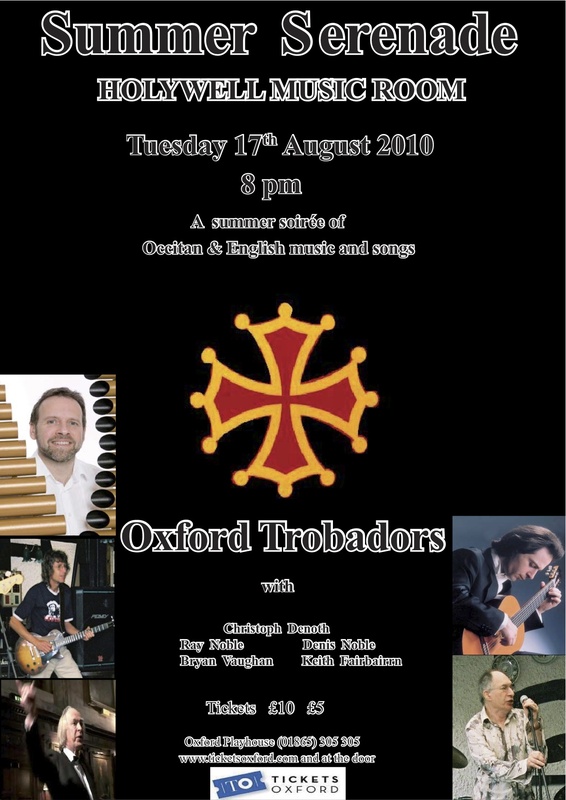 If you are around on 17 August, you may wish to catch the Oxford Trobadors doing a Summer Serenade. They include an incredible guitarist, Christoph Denoth, and one of Oxford’s most distinguished professors, Denis Noble, who signs some Occitan songs quite well.